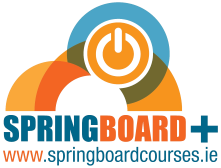 Welcome to Springboard+, the online system for submitting Springboard and ICT Skills Conversion course proposals in 2016. The system has been developed to make it easier for prospective providers to submit and manage their course proposals. Springboard+ features a fully online, paperless approach to the submission of course proposals. Springboard+ is a fully secure system, hosted by HEANet. To submit a course proposal you are required to register on this web system. As part of registration you will be asked to input information on your college, and contact details. Please note that user registration for the 2015 proposal submission systems do not carry through for 2016 and such users are required to register again. In advance of preparing proposals for submission we ask that you familiarise yourself with the following Call requirements. Click here to read the Call requirements for Springboard+ and to register. Springboard+ will support part-time courses of twelve months or less in duration which are provided by public, private and not-for profit higher education providers. Consideration will also be given to intensive, accelerated courses of 12 months or less in duration in all skills areas. ICT skills conversion courses will be supported via Springboard+; provision of such courses remains a priority as part of Government policy and to meet targets set in the national ICT skills action plan. (b) Lead to a higher education and training award that is aligned with the Irish National Framework of Qualifications at Levels 6-9. These awards must be aligned with the Irish NFQ as at 01 January 2016. Collaborative proposals from two or more providers will be considered for funding, including those who form part of the new regional clusters in higher education. A lead provider must, however, be clearly identified as part of the proposal and the proposal must adhere to all requirements regarding quality assurance and the making of awards. Proposals are encouraged from providers with enterprise partners who have been involved in the design and delivery of courses, including through the provision of work placements/internships. To ensure that Springboard meets the needs of unemployed people with a range of previous education qualifications, providers are encouraged to propose courses which have been designed for participants with no previous higher education experience. As part of course proposals, providers will be required to set out the teaching, learning and assessment methodologies that will be used to meet learner needs, including flexible approaches; practical application of learning; and study skills/return to learning components. Academic and pastoral supports should also be referenced, including details of job readiness training and, where relevant, work placement/internship supports. Regarding entry and achievement of an award, it is expected that proactive Recognition of Prior Learning (RPL) will be used by course providers, and details of each provider’s policy in this area will be required as part of course proposals. Arrangements to promote and raise awareness of Springboard+ course opportunities will also be required, and will be assessed as part of proposals. Requirements under the ESF Programme for Employability, Inclusion and Learning (PEIL) 2014-20.
for Enrolled Learners (PEL), if required, must be approved as part of the course validation process. Course proposals must be made using the online course proposals template. Important information accompanying the template include the background information on the Call, the EGFSN 2016 Guidance for higher education providers on current and future skills needs and Additional information on ICT skills conversion courses.